One Oxbridge professor,unable to accept where he'd ended up, regularly gave himself away; he said "here" when he spoke of England, "there" when he spoke of the new world. - Marjorie Doyle, Reels, Rock & Rosaries, Pottersfield, 2005, p. 36, inadvertently making a Great Big Funny. Why does it take so long for the overcaffeinated web gnomes at the House of Assembly to post the actual text of bills to that series of tubes that Al Gore invented? "Speaking at the Mount Pearl Chamber of Commerce this morning, Business Minister Paul Oram said the province’s future is strong, and remains an attractive place to do business." So reported the Telegram the other week. It's a good thing the future is strong, at least — is it still "ours"? is it also "proud" and "determined", that future? — because some people are starting to wonder about the present. My, my, but the voter turnout is super-heavy on today's VOCM Question of the Day, "Do you think the premier is bullying public sector unions?" The Honourable Danny Williams, Premier of Newfoundland and Labrador, will speak and present awards at the Duke of Edinburgh C.O.S.T.A. Bronze and Silver Awards Ceremony today (Wednesday, November 26) at 2:00 p.m. The ceremony will take place in the Banquet Room, Glen Denning Golf, 120 Gabriel Road, St. John’s. The Honourable Susan Sullivan, Minister of Human Resources, Labour and Employment, will speak and present awards on behalf of The Honourable Danny Williams, Premier of Newfoundland and Labrador, at the Duke of Edinburgh C.O.S.T.A. Bronze and Silver Awards Ceremony today (Wednesday, November 26) at 2:00 p.m. The ceremony will take place in the Banquet Room, Glen Denning Golf, 120 Gabriel Road, St. John’s. These charts are actually the average of two models, one of which shows the ADQ winning narrowly in up to four seats, and the other, well, not so much. Danny Williams — or Newfoundland and Labrador — is now proud to be a contributing province to the Vancouver 2010 Winter Olympics. Funny how the tune has changed from just four years ago. The latest Léger numbers, crunched. Clever colour scheme explained here. There seems to be no legal way out of that dilemma; we just have to wait until the contract expires in another few decades. If global warming doesn’t mess things up, water should still be running downhill then, and our grandchildren will hopefully gain some benefit from it. That sad reality is just another reason to tread carefully on any potential agreement for the Lower Churchill hydro project which is still waiting to get off the ground. The people of this province have never been able to put the Upper Churchill deal behind them and will never stand for another give-away of any of our resources — hydro power or otherwise. Is that what Danny Williams-Government has been doing on the so-called "go it alone" Lower Churchill? What, after engaging in holy wars against both Quebec and Ottawa, even as he solicits their cash to "go it alone" with? Or, for that matter, is He "treading carefully" on the Hebron deal, which — unlike, say, the Voisey's Bay one — was never, and will never be, brought before the House of Assembly? Too bad that the Star, for some unfathomable reason, doesn't fill in the rest of the blanks: "treading carefully" has not been, is not, and probably never will be a hallmark of Danny Williams-Government. "Don't let it happen again"? Newsflash, newsroom: IT ALREADY HAS. You would think this is the kind of news that you'd want out earlier in the day, what, with a government that is proud, strong, and determined and all that. This would instead seem to be the kind of news you announce at ten to five. The kind of news that you're not exactly proud of. It received millions of dollars from the Atlantic Canada Opportunities Agency and private sources. Last week a major investor — Toronto's the Quorum Group — foreclosed on Consilient, leaving the company unable to pay its employees or its rent. At its peak, it employed more than 40 people. Consilient was long a darling of the provincial government press release releasers, even getting a walk-on in the 2006 Speech from the Throne. Apropos of nothing in particular, up to 2006, Consilient had been a very good, um, corporate citizen, donating $7800 to provincial political parties in Newfoundland and Labrador over the course of seven donations. One of them, $900 in 2001, was even to the provincial Liberal party. How much rent would that have paid? Oh well; it's all academic now. Premier Danny Williams is cautiously upbeat about the prov-ince's economic future, even in the face of a looming recession. Williams said that's because of a combination of strong natural resources revenues and his government's sound management of the economy. "If we do, in fact, get into a deep and long recession, I think our province will be as good or better off than any of the other provinces," he said. "The island will be affected, and transportation costs will be affected at some point throughout this, however I think we'll be fine." It would turn out that Danny Williams-Government was right. The Island of Labrador is being affected. Premier Danny Williams says our most potent source of power isn't oil, but our people. Williams says the last thing we need is for our young people to pack up and invest their power elsewhere. One hundred and sixty young adults along with 40 decision makers attended a summit to discuss making Newfoundland and Labrador a province of choice for young people to live and work. Human Resources Labour and Employment Minister Susan Sullivan and Premier Danny Williams addressed the youth delegates at the Youth Retention and Attraction Strategy summit at the Fairmont yesterday. Twenty year old St. Anthony native Kara Snow says Newfoundland and Labrador is a proud strong determined province and the people here have a lot of things to show that. But what about the future, Kara? Isn't the future ours or some such? When are we going to put an end to this unfortunate and demeaning phrase which classifies citizens as "have" and others as "have not"? We must be the only country in the world that uses this terminology. and remove them, the whole lot, as the pivot around which all federal and provincial political discourse in Newfoundland and Labrador has ultimately revolved for the past two decades. The timing of the announcement — after 4:00 p.m. on a Friday afternoon — had the hallmark, and timestamp, of a batch of patronage appointments or layoff notices. Danny Williams-Government seems almost ashamed of the fact, but it's true: the House of Assembly will be back in session on November 25... just in time to break for Christmas. "The sitting of the legislature is an important part of our democratic process," said the Honourable Joan Burke, Government House Leader. "We look forward to a productive session with respectful and healthy debate on the legislative agenda and issues during the fall session of the House of Assembly." Ah yes, healthy debate and democratic process... the trademark of the conduct of the Bow-Wow Parliament during the Danny Williams-Government years. Still, given that Joan Burke, not so long ago, was using the "busy schedule in the house of assembly and certainly the tedious work in developing the legislation" as the reason "that we didn't have sufficient time … for the full debate that it deserved" — the "it"/"legislation" in question being the long-promised Grenfell autonomy bill — a parliamentary junkie can't help but wonder... why not bring back the super-de-dooper busy House of Assembly some time during the first 90% of the calendar year, instead of in the last 10%? This, gentle reader, is why legislatures should have a good committee system, a healthy atmosphere in which the majority doesn't just ram its legislation through without sober second thought, respect for multiple readings and the reason behind them, and a willingness to consider and study the legislation contemplated or enacted in other jurisdictions. Great supporter of Danny, and the Government has no control over the global economy or price of oil, but it will be interesting that Danny and the Conservatives realizes how well Grimes and Tobin did with what they had to work with, this is not an easy Province to govern or to provide health, aconomy and services. In the meantime, Danny will be a great leader if things become leaner, as well. In my opinion every dollar that Canada spent in Newfoundland and Labrador, it extracted $10 or more to pay for it. You see, this is one of those things that it is impossible — literally, impossible — to have an opinion about. You can no more have an “opinion” about whether the federal government spent more in Newfoundland and Labrador than it received in taxes, than you can have the “opinion” that π=4. Federal government revenues collected in Newfoundland and Labrador are either higher than its expenditures, lower, or exactly equal. One of these three possibilities must, mathematically, be objectively true, with no room for opinion. At least insofar as the years 1981 to 2005 inclusive are concerned, the answer is that the federal government of Canada spent more in, or in respect of, Newfoundland and Labrador, than it collected in federal revenues, in every single year. Federal revenues collected in Newfoundland and Labrador during this period from all sources – personal and corporate income taxes, EI and CPP premiums, import duties, federal sales taxes, etc. – amounted to roughly $39.9-billion. This represented between 1.15% and 1.35% of all federal revenues for any given year during this period, and totalled, during those 25 years, just over 1.21% of all federal revenues collected across the country. For reference, the provincial population started this period at about 2.3% of the national population, and ended it at about 1.6%. In every single year, the province’s share of federal revenues was smaller than its share of the national population. On the expenditure side of the ledger, the federal government spent $16.9-billion on procurement in the province between 1981 and 2005 inclusive. It spent $36.1-billion on transfers to persons – CPP, OAS, UI/EI, etc. – which is ninety percent of what it collected in federal revenues. It transferred $38-billion to the provincial government – net of the small amounts transferred from the province to the federal government – or an amount equal to 95 percent of what it collected in revenues. The federal government paid out over $8.1-billion in wages and salaries to residents of Newfoundland and Labrador during that period. And finally, two of the smaller line items, there were $2.8-billion in transfers to businesses, and $300-million in transfers to municipal governments. From 1992 to 2005 inclusive, the provincial government, or the province as a whole, received more in expenditures under every one of those line items, as a share of pan-Canadian spending, than the province’s share of the population. Newfoundland and Labrador’s share of all federal transfers to persons and transfers to provincial governments was larger than its population share in ALL of those years. Procurement, transfers to businesses, transfers to local governments, and federal salaries, merely outstripped the provincial population share in most of that period. In total the federal government paid out, to the provincial and local governments, to residents, and to local businesses and organizations, over $100-billion – that’s a “b” – a net “profit”, for those who feel governments should be run like a business, of over $62-billion. Earlier and later data either isn’t available yet, or not completely available on an apples-to-apples, oranges-to-oranges, comparison. But, other than for the sake of data completism (mmmm…. completism), you don’t even need that data. In order for the federal government to have “turned a profit”, or collected more in revenues than it spent in the province, it would have to completely reverse that $62-billion “profit” which accrued to the province in just 25 years. In other words, it would have had to collect $62-billion MORE in revenues than it paid out in expenditures. The math tells you that that is unlikely. The entire federal revenue in all of Canada in 1981 was $62-billion. In Newfoundland and Labrador, it was $716-million. Obviously, in past years, both numbers would have been smaller. But even if Newfoundland and Labrador had contributed, for the sake of argument, $716-million in revenues every year, all the way back to 1949, with the federal government having spent not a penny in the province, it would only reduce the province’s “profit” by less than $23-billion. And, for the sake of argument, assuming that the province contributed $5-billion per year after 2005 – roughly double the 2005 figure – and again, for the sake of argument, assuming the province got nothing at all in return – the “profit” that the province would have taken in since Confederation, by reason of being part of Canada, would still be over $24-billion. That’s the math. Math, unlike the lazy, the intellectually dishonest, and those with lazy and intellectually dishonest agendas, doesn’t have “opinions”. Boy, it would be really embarrasing if you were a provincial cabinet minister, and you called into an open line show like No Names Please's, during CRA sweeps month, and you basically just stammered through reading straight out of the press release you issued on Wednesday. We would all be really embarrassed, wouldn't we, for any cabinet minister that was given marching orders to go out during CRA sweeps month and flood the open line shows with HappyNews (too bad you couldn't get on today, Jackman, try again), and this was the best that she or he could come up with. It doesn't project confidence or competence at all. It would be emarrasing, too, for a radio host who didn't catch a cabinet minister out on such nonsense and amateurish behaviour. Yip. It would be embarrasing. Let’s call this the Blunderdale Principle: In order to make better deals, a government needs strong opposition. Just look at the empirical evidence. Voisey’s Bay. Blunderdale says it’s a “better deal”, and that it’s a “better deal” because, at the time, there was “strong Opposition”. And while she didn’t draw the parallel, you only need go back to Smallwood’s final term, the one that gave us Churchill Falls, when a strong government faced an opposition of just three seats. So, what does that say about the deals that Danny (where’s Danny?) is making now? And what does it say about Danny (where’s Danny?) and his determination to wipe all opposition, within the House of Assembly and without, from the face of the earth? As a treat for recovering election junkies who are wondering, post-federal, post-Nunavut, post-American, post-New Zealand elections what to do for their next fix… two words: Quebec. Quebec also has the added attraction of absolutely exquisite electoral data publication, broken down beautifully by municipality, and, in the past decade, made available, in a timely manner, and in digital form, to election nerds. Running the latest Léger poll through the soopersekrit Calcutron 2008, yields the following projection for seats in the National Assembly, if — this is the important part — if the poll numbers were the final popular vote when everything is counted. 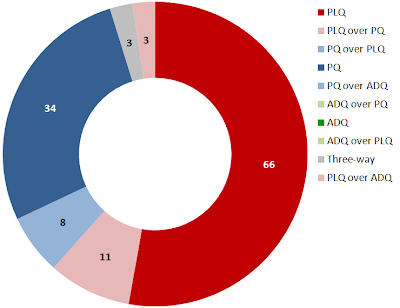 How to read this graph: the saturated colour bars show the number of seats that each party would be expected to win by a margin of five percent or more. 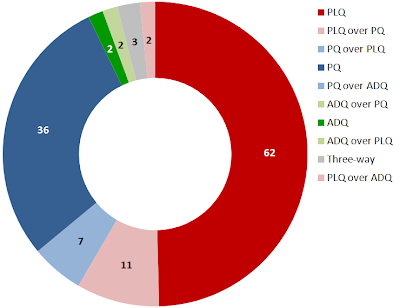 In this case, the Léger poll conducted over the weekend would be expected to result in 54 Liberal (PLQ) MNAs elected by at least that margin, while there would be 43 Péquistes. In between the saturated bars, there are two paler-coloured bars which show the expected narrow races, where the result is projected to be less than five percent between the parties on either side. 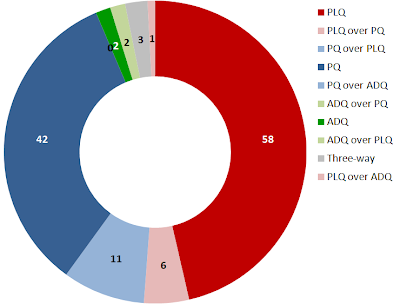 In this case, there are 19 such electoral districts with notionally close races between the PLQ and PQ, in which the PQ has the edge in 13, and the PLQ in six. There are also, on these numbers, four notionally three-way races, in which the first-place party and third-place party are separated by ten percent or less. There were 38 solid PLQ seats (won by more than five percent), 32 ADQ, and 24 PQ. 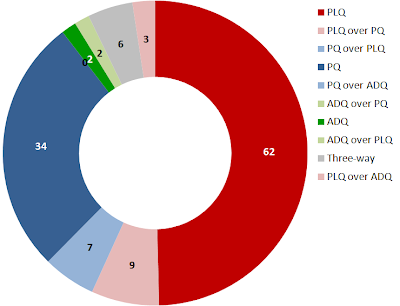 There were eight close PQ-PLQ races, of which the Péquistes won six and the Liberals two. 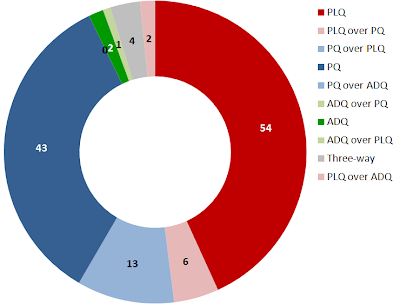 There were eight close PQ-ADQ races, of which the ADQ took five and the PQ three. 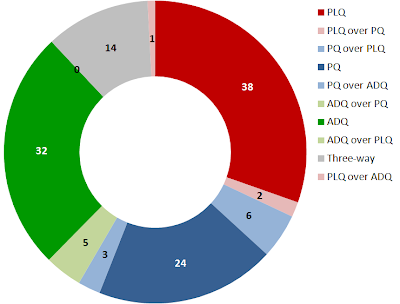 There was one close PLQ victory over the ADQ. And finally, fourteen electoral districts saw the winner and the third-place candidates separated by less than ten percent. Ever-so-slightly mitigating factor: At least the musical Cult of Dan is based on fiddle-dee-diddle and Canned Trad, not Eurotrash. The following is a real article, with particular details and dates obscured. There's a prize — really — for the first person (other than an anonymous troll) who can post or email the date of this article. ST. JOHN'S — The Newfoundland Government and [COMPANY] of [CITY] have agreed to share the cost of a $500,000 study to determine the feasibility of a major aluminum smelter in Newfoundland. [PORTFOLIO] Minister [NAME NAME] said a joint management team from the company and the provincial Government has been established to direct the study, which is scheduled for completion by the end of 19__. Last month, Mr. [NAME] estimated the cost of the proposed aluminum smelter at $1-billion. Being evaluated as the energy source for the aluminum smelter are two sites in Labrador on the Churchill River. A power plant at Muskrat Falls would cost $3-billion to $4-billion, while one at Gull Island would cost $4-billion to $6-billion. The larger Gull Island site would deliver power at a per unit energy cost about 40 per cent lower than a Muskrat Falls project, the announcement said. [COMPANY] is a subsidiary of [COMPANY] of [CITY]. Why is it up to Our Dear Economist to drop this little hint on the eve of the final CRA field time of 2008? No more bread coming in from the equalization program? What better excuse could there be for circuses? A party 51 years in the making is planned to mark Newfoundland and Labrador officially becoming a "have" province. "We do plan to mark this momentous occasion," said Elizabeth Matthews, spokesman for Premier Danny Williams. The plans are still in the preliminary stages, but Ms. Matthews says a major celebration will be held. On Monday, it was revealed that Newfoundland no longer qualifies for federal equalization payments -- the first time that's happened in the history of the program. So, for the nth time... if We Knew What We Were Fighting For, and what We were fighting for was to maximize both the amount and duration of Our equalization entitlements, then why is the end of such payments a reason to celebrate? Or, conversely, what was up with the Equalization Wars of the past five years, if getting off equalization was something to celebrate all along? For good measure, if there's all this stuff that We still can't afford, why are We blowing a wad of money on this "major celebration"? So, y’know, we know the hardships, and we know what it’s like to be in receipt of [equalization], and I don’t think any of the provinces want to receive equalization at any point in time, but we’re just very proud and honoured and very pleased that in fact, right now, we can go it alone, and mumble mumble — excuse me, don’t quote me on that, we can go it on our own, from that perspective. Not “go it alone”, but rather “go it on our own, from that perspective”? We certainly hope to be proud non-recipients of equalization on a go-forward basis. But, seriously dood, in that case, what was up with the never-ending five-year battle to maximize both the amount and duration of Newfoundland and Labrador’s equalization entitlements? And why does no one ever ask? COFFEY , Q.C. : If we could look , please , at Exhibit P - 0015 , and , Mr. Williams , this is a story that was carried in the Globe and Mail , October 6th, 2005. It's entitled "Hundreds of tissue samples from Newfoundland and Labrador breast cancer patients dating back to 1997 are being retested after major flaws in a laboratory 5 test were uncovered". That's the subheading. The actual heading is , "Flawed test imperils scores of cancer patients". This is just one story. The Commissioner has seen a number of them. There are a number throughout October. MR. WILLIAMS: The Globe and Mail are no friends of Newfoundland and Labrador , I can tell you that much. Put that on the record. MR. WILLIAMS: Well , you know , I can say that , from a public perspective , I mean , if it was in the Globe, I perhaps would have read it. “For too long, we’ve been perceived as second-rate citizens, or Canada’s poor cousins,” Newfoundland and Labrador’s newly minted finance minister, Jerome Kennedy, said in an interview from the Toronto airport. "been perceived" by whom, Jerome? Why the passive voice, Jerome? Why the inferiority complex, Jerome? "One day the sun will shine and have-not will be no more," said Brian Peckford in 1982. "This is a very proud day for Newfoundlanders and Labradorians, I can tell you. We received information today from the federal government at the finance ministers' meeting that as a result of changes in the figures that as of today — which is a notification — but effectively this year Newfoundland and Labrador is now a have province. That's a momentous day for the people of this province. "For 60 years we've been part of the great Canadian federation and we have been recipients of equalization payments from the Canadian government. Over the years we have been ridiculed for that. At times times we've been presented as the poor cousins in Canada. Now we can hold our heads high and feel very good about it … I consider it to be a very significant day for all the people of the province and I want to share this moment with them." "The Canadian government," he says, as if it was the government of another country. And it's kinda hard to have been recipients of equalization for 60 years, when this is 2008, and the program only began in 1957. So, will anyone ask Danny: if today "we can hold our heads high and feel very good about it", why, oh why, has Danny's very reason for being for the past five years been to maximize both the duration and the amount of equalization payments in the first place? Heck, why has (virtually) no one asked that question in the past five years? It’s good, however, that Williams decided to keep the cabinet down to the size it was following the last election, and has not given in to the urge to bulk up the ranks. Standing pat is at least better news than an increase — still, there are valid arguments that a province the size of this one might not need quite so many seats around the table. It’s an argument worth making — and one that both the Liberals and the Conservatives made before Williams came to power in 2003. The Liberals said they would have a cabinet with a maximum of 16. The Tories? Williams did say the Grimes administration was bloated at 19 cabinet members, and Williams brought in a 14-member cabinet when first elected. But cabinets, like waistlines, seem to expand with age. But, hey, good on that Danny Williams for keeping the full cabinet down to one entire minister fewer than Roger Grimes had.